I think this is the first time I’ve had to swap out a task during the Cure. Today’s assignment is to purge the pantry of unused items that you know in your heart of hearts will never be used, items that are past their expiration date and things that just don’t belong there. Unfortunately, my pantry is right next to the AC intake and the technician from the AC company will be here this morning performing routine upkeep duties for a couple of hours and a ladder will be blocking the pantry doors. As soon as he leaves I have to run up to Wickenburg to pick up a couple of bales of alfalfa hay that I should have picked up yesterday, and then spend some quality time with rain soaked pony stalls and the muddy barn aisle. I do, however, have a cabinet in the kitchen, well away from where the AC dude will be working, that needs a good hearty purging. It’s got a lot of cool stuff in there that I would use, if I could find it. So, I will swap out the Purge the Pantry task with the Cabinet Cleanout mission that is coming up on everyone’s calendars on the 17th. Thankfully, tomorrow’s easy mission is to set up the outbox because I get to spend quality time with my mother-in-law tomorrow and need to tighten doorknobs to get them off my list. This is the problem cabinet. 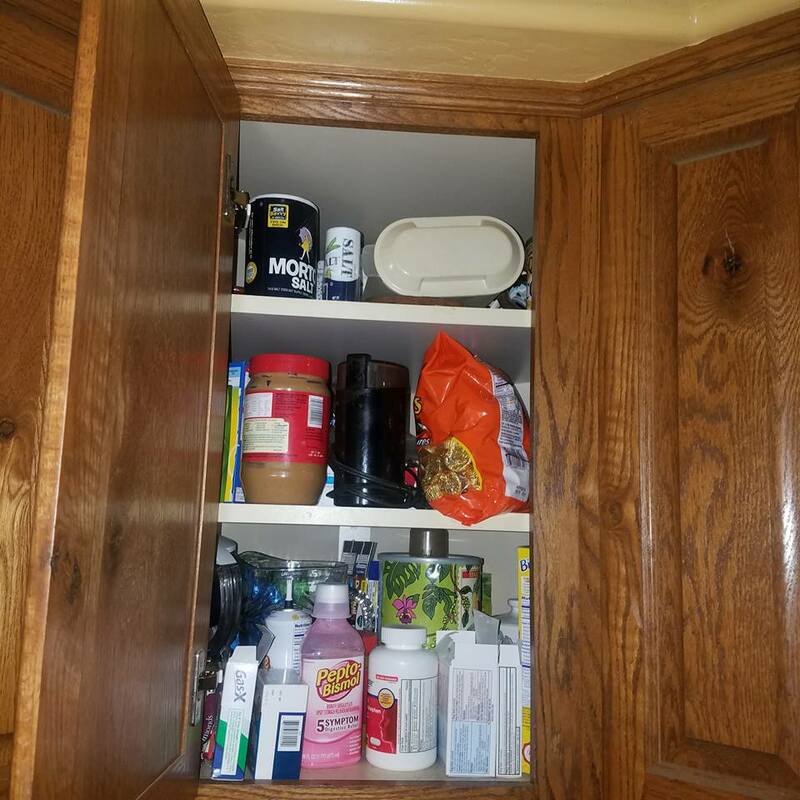 Adding to the issue of too much stuff in there that needs to be pitched, is the fact that this is a corner cabinet of which only one third is visible when opening the door. Inevitably, stuff gets buried in the sides where it’s not easy to see. I don’t see an easy (read as affordable) solution to this dilemma, so I’m off to do the best I can with what I’ve got. The middle shelf and top shelf are going to be trouble. Except for the items in the front of the middle shelf, I’m pretty sure everything else on those two was packed there by my 6’4″ husband. I have several shelves like these in the house that have stuff I could probably use that he put out of my reach. I’m adding those to my list of things to do once a month so I can reclaim some nifty items. Cool tools. 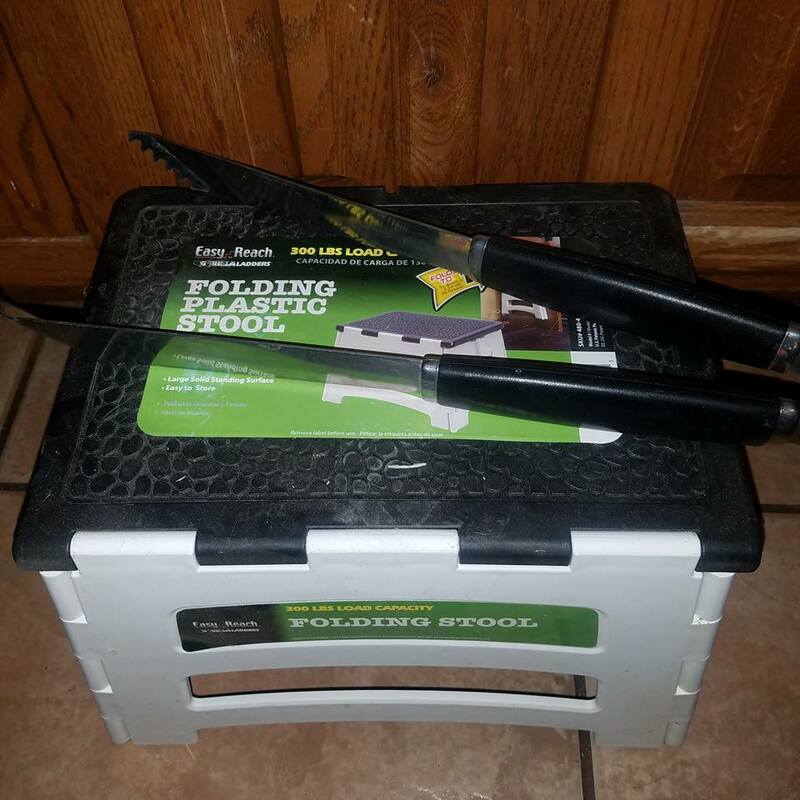 I’d never tried to use this little step stool I picked up on sale at Home Depot 6 months or so ago. 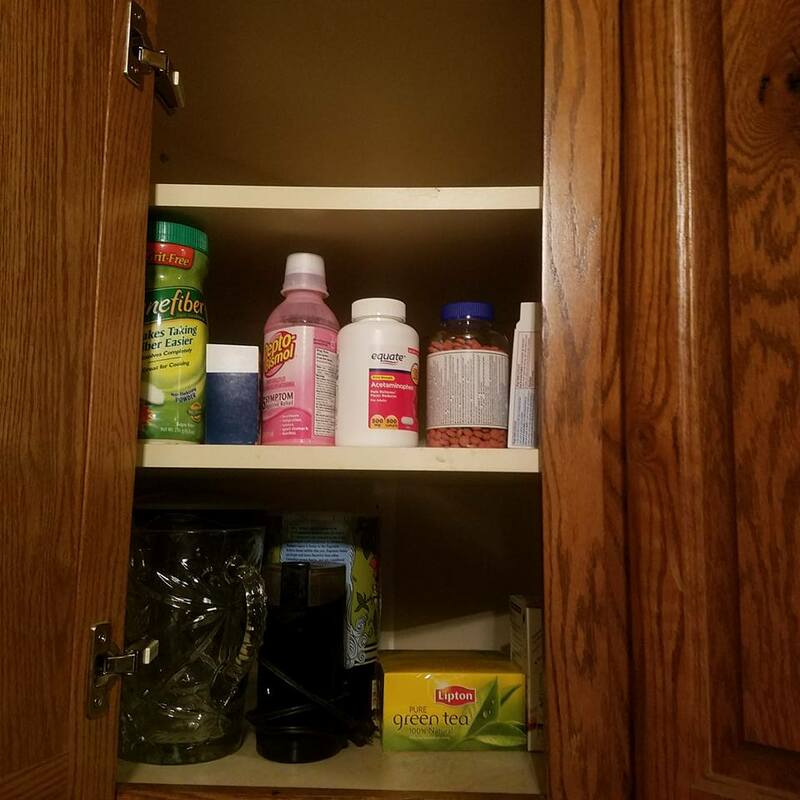 Since I had a counter top and cabinets to cling to for balance, I could at least reach the front of those upper shelves without fear for life or traumatic brain injury. The cabinet is deep however and my honey had crammed it full to the very back corners. BBQ tongs to the rescue! 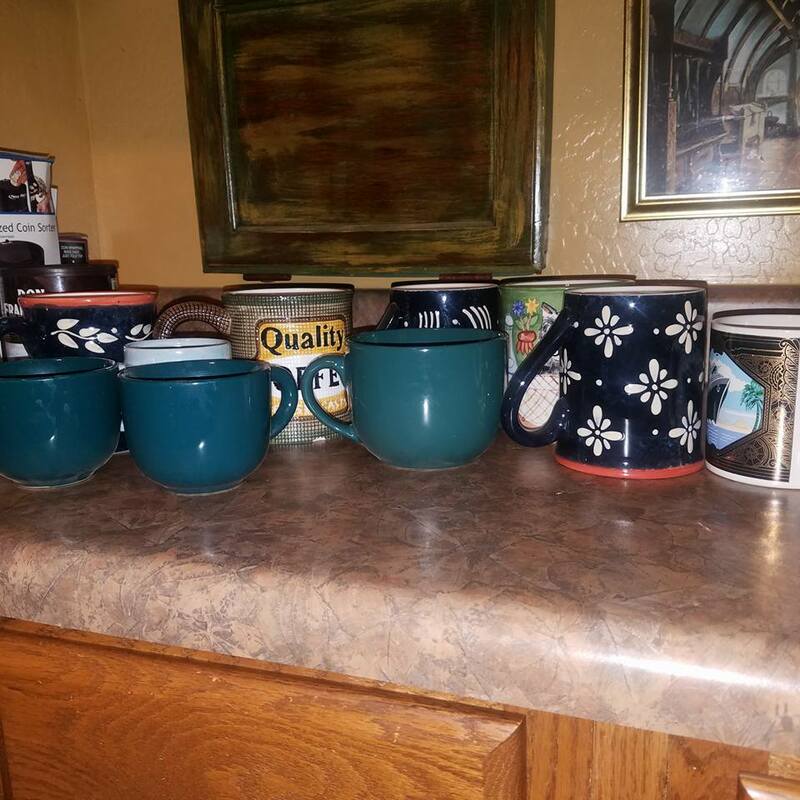 Amidst the expired peanut butter, stale crackers, Christmas candy stash from 2 years ago and a year old bag of tortilla chips (eww), I found an amazing array of coffee mugs I’d forgotten we had. They aren’t microwave safe and are really too big for coffee, but they were great for soups. My husband didn’t like them for coffee because it cooled to quickly in them and he thought they were redundant since we already have soup bowls and he was probably right. I will likely put them in the outbox, but I remember the folks that gave them to us so I’ll think on that a bit and see if I can come up with something useful to do with them. These two cuties! 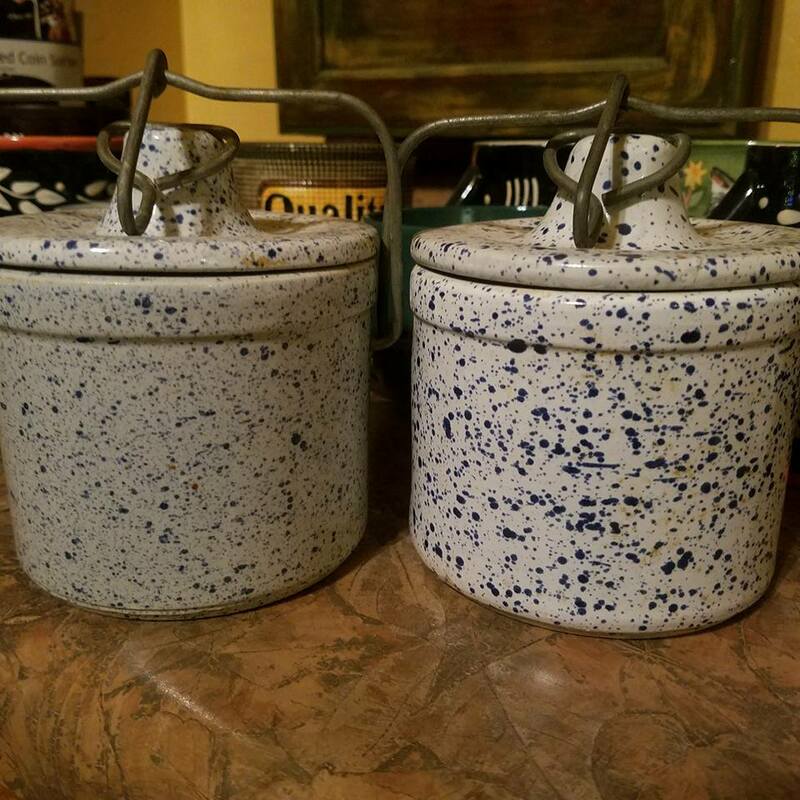 I’d gotten these at separate garage sales years ago and used to keep sugar and creamer in them for when guests came by for coffee. Unfortunately, it seems no one has ever heard of “coming by for coffee” anymore, but they’re keepers none-the-less. SCORE! 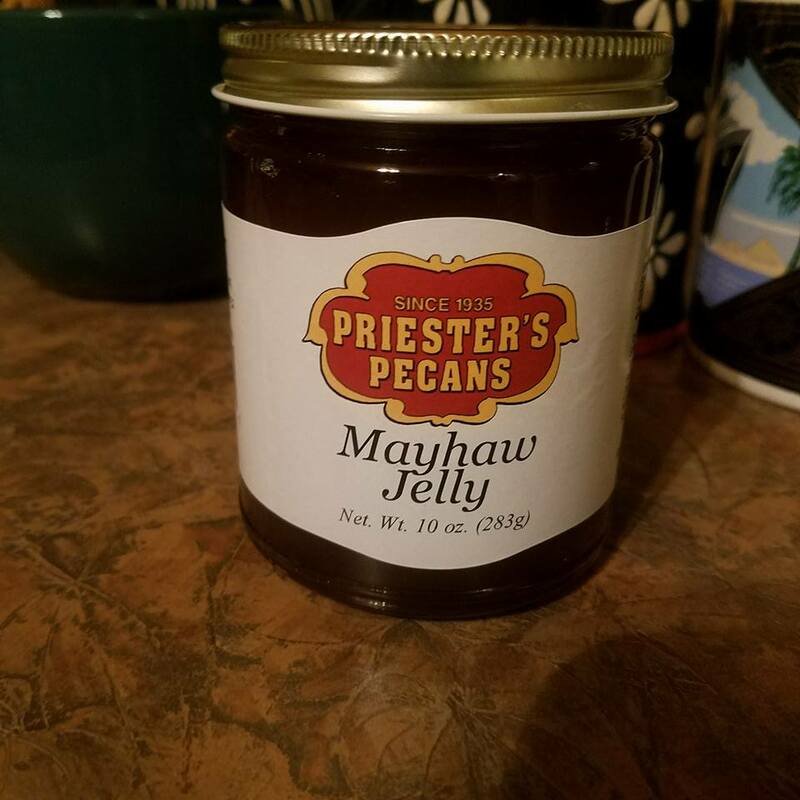 I knew I’d gotten two jars of Mayhaw jelly on amazon last summer. This is what I get for hoarding things I can’t readily find here, it gets buried behind other things and I can’t remember where I stashed it “for later”. Toast and Mayhaw Jelly just got put on the breakfast menu this morning. And TaDA! Cabinet is cleared, cleaned and organized. 3/4 of the cabinet is empty. What you see is all there is. Nothing is hiding behind it that front row. Kind of a shame to have all that wasted space behind but I wasn’t the builder, so it’s not my fault. Okay, I’m outta here. The hounds and Kraken puppy are making we’re hungry noises, the ponies, goats and chickens need tending and the A/C dude will be here in an hour. Good luck with your pantry purges today folks!